We offer high quality, full colour digital label printing at extremely competitive prices. We use two of the industry’s best-in-class digital printing presses: the Xeikon CX-3 ‘Cheetah’, which provides extraordinary quality, versatility and control. 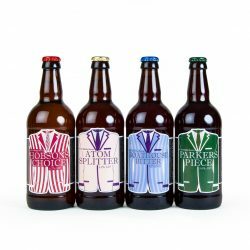 For our customers, this means comprehensive customisation of material, colour, finish, adhesive, size and shape, as well as personalisation on every individual label if required. Ensure that your products give the best impression with vibrant, crisp graphics. Our utilisation of new technology means you no longer need to sacrifice quality; the arrival of our second digital press means we can now manufacture full colour labels with a premium appearance at competitive prices, for even small runs. These can be supplied as sheets or on rolls, with rolls having a choice of cores ranging from 25mm to 76mm. We are also able to produce extra-large labels several metres long and up to 330mm wide. For a small cost we can produce proofs using the actual material selected, with the actual finish you selected, so the proof is an authentic reflection of what the result will be. 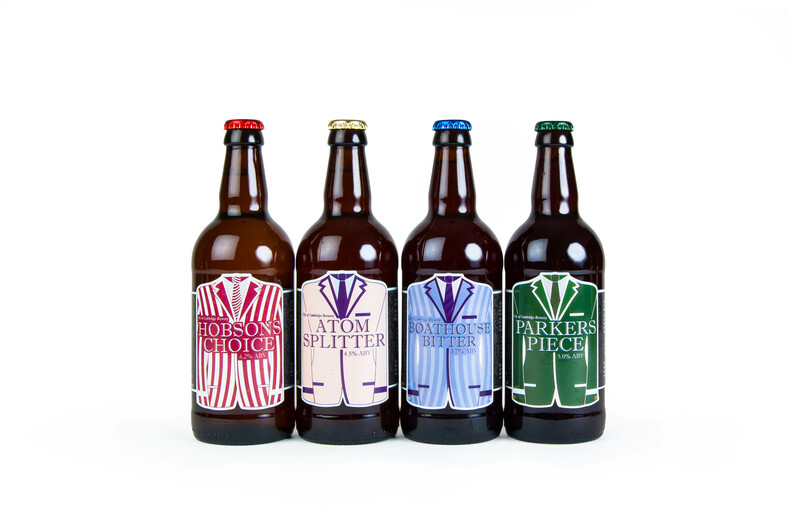 With digital, there is an almost limitless combination of options available for you to fully customise your label, from all shapes and sizes, a full spectrum of colours to the final finishing touches which can give your product the edge over your competitors. Different products require different types of material / adhesive combinations and we provide label solutions regardless of what your label is being applied to including: glass, plastic, metal and wood. We produce BS5609 approved labels for chemicals, weatherproof labels for outdoor use, and many more. 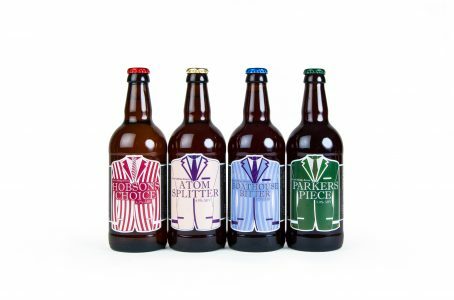 We have 2 state of the art AB Graphic finishing lines that allow all our digitally printed labels to have an optional finish added. 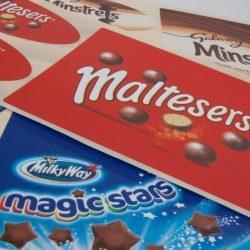 There are a wide variety of finishes available including (but not limited to): over-laminating, flood or spot varnishes, as well as gold and silver foil embellishments. You have complete customisation of the content on each individual label, if your project requires it. 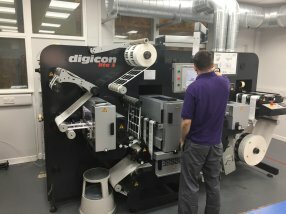 Our presses allow for completely variable printing; this means that each label can be printed uniquely, and it is therefore possible to make small changes on each item (for example, a unique code) making the digital printing method perfect for promotions. It is also possible to segment different designs within the same order, which can potentially minimise costs even further. Should you choose digital or high definition flexo? Different printing methods have various advantages and disadvantages, and digital may not be the best option for you. Since we utilise both digital and high definition flexo printing presses, we can recommend the most suitable setup for you based on your priorities and requirements. Various finishes such as spot varnish, over-laminate, and gold or silver foil can be added to a print job. If you require a very large run with unique content segments it is possible to combine our printing methods to minimise the cost. 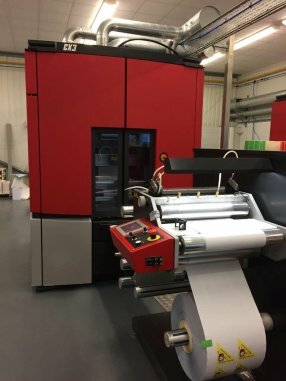 Static elements can be crisply printed en masse using traditional methods and then utilising our digital presses we can add unique information. This method can offer better overall quality and lower cost per unit when compared with pure digital. Get in touch with a member of our sales team for a quote by phone or by filling in our enquiry form – all enquiries will be responded to within three working hours.